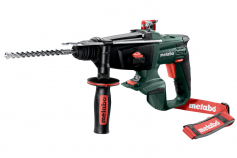 With the 18V cordless hammers from Metabo you can drill holes in concrete up to a maximum diameter of 24 mm. The two largest cordless combination hammers KHA 36-18 LTX 32 and KHA 36 LTX manage even 32 mm in concrete without any problems. The battery-powered hammers thus can very well keep up with mains-powered SDS-plus rotary and chipping hammers. Equipped with high-performance hammer action, the cordles hammers deliver a very high single-impact energy for fast work progress in concrete and masonry. For chiselling also cordless combination hammers with rotation stop can be used. 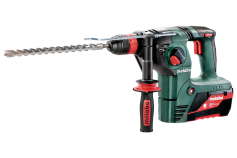 Almost all cordless combination hammers are operated with 18 volt battery packs. In addition to the cordless hammer KHA 36-18 LTX 32 that uses two 18 volt battery packs, there is the KHA 36 LTX, almost identical in design, which is operated with a 36 volt battery pack. In closed rooms or areas sensitive to dust, dust-free drilling is needed. This is where the cordless hammer KHA 18 LTX BL 24 Quick comes in. It has an integrated extraction interface that permits dust-free drilling. 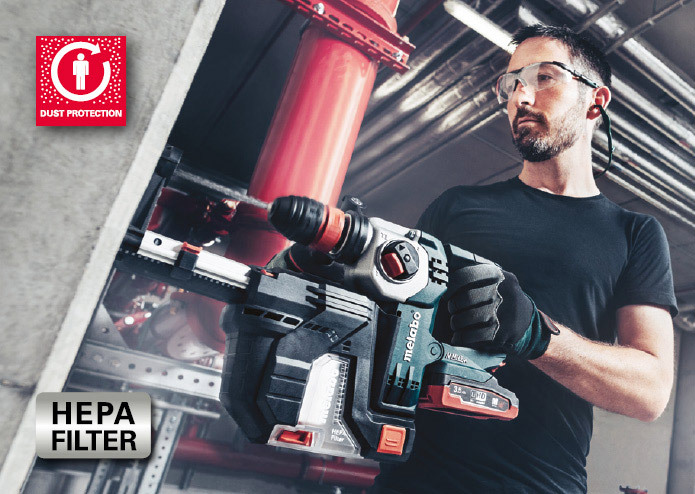 The compact dust extraction ISA 18 LTX 24 is mounted quickly and without tools to the cordless hammer. It has a HEPA filter that catches even the smallest dust particles while drilling. The drilling capacity is maintained at 100% with this active dust extraction. 3 seconds delay after switching off the cordless hammer remove the residual dust from the drilled hole. This cordless combination hammer with dust extraction is unbeatable also when drilling over head. The dust extraction unit ISA 18 LTX 24 can also be ordered as accessory and can be retrofitted. Thanks to the SDS-plus tool holder of the cordless hammers the accessories can be changed in a jiffy. Hammer drill bit out, chisel in and off you go. In addition to the hammer also the quality of the accessory used is of great importance for perfect work results. 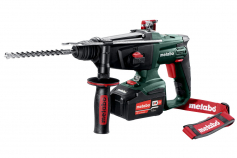 Metabo offers an extensive range of high-quality SDS-plus hammer drills and SDS-plus chisels. Different quality classes with different product characteristics are available for the drills and chisels for the individual requirements. Standard diameters of the drills are available as an assortment in the respective quality class. Quick hammers are suited for drilling in wood and metal. The hammer chuck can be replaced without tools with the supplied keyless chuck for tools with cylindrical shaft. Like this any standard cylindrical wood or metal drill bit can be securely clamped and used.